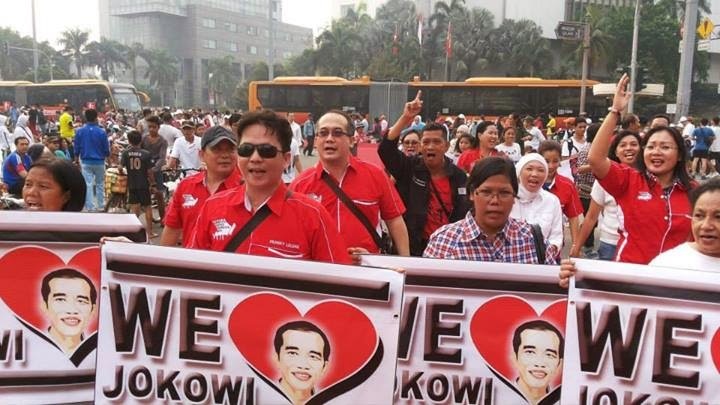 Supporters of the Indonesian Democratic Party of Struggle’s (PDI-P) presidential candidate, Joko “Jokowi” Widodo, have distributed leaflets containing the endorsement by the party’s chairwoman Megawati Soekarnoputri of the Jakarta governor. “I, Megawati Soekarnoputri, the chairwoman of the Indonesian Democratic Party of Struggle, mandate party official Ir. Joko Widodo to be the presidential candidate of the PDI-P,” said the leaflet distributed by the party supporters in Jakarta on Sunday, as quoted by Antara. The leaflet distribution took place in several locations such as around the Youth Pledge Museum, the National Awakening Museum, the Investigative Committee for the Preparation of the Independence of Indonesia (BPUPKI) building, the Pola building, the Cendrawasih building, and other places passed by the PDI-P campaign convoy. The leaflet distribution in around the Youth Pledge Museum at Jl.Kramat Raya, Central Jakarta, caused traffic congestion as travelers stopped their vehicles along the road to see Jokowi who was visiting one of the most historic places in Jakarta. Similar congestion occurred when Jokowi visited the BPUPKI building (also widely known as the Pancasila building) at Jl.Pejambon, Central Jakarta. The presence of PDI-P supporters from other areas across Jakarta worsened the traffic gridlock. PDI-P campaigner Eriko Sotarduga said Jokowi’s visit to the historical landmarks in Jakarta during his inaugural campaign should become a milestone for the awakening of Indonesia, a country with great historical moments. “This is the beginning of ‘Great Indonesia’. We should start the national awakening. Only a great nation is able to respect its history as stated by Soekarno: ‘Jas merah!’ [Don’t forget the history],” he said.